Confusingly for students of Italian twentieth century music, there were two composers called Gino Marinuzzi, father and son: and neither are at all well known. The father (1882-1945) is known nowadays if at all for his rather Wagnerian verismo opera Jacquerie (1918), but was also the first conductor of Puccini’s La Rondine. Afterwards he was joint principal conductor with Victor de Sabata at La Scala. The booklet note for this issue states baldly that the music for Jacquerie “had been lost” when his son wrote his last work, a two-piano version of the opera, in 1996. There is in fact a recording of the opera taken down at a performance in 1994 which is described as having been ‘reconstructed’ by the son at that time! In fact, as the booklet explains, father and son had sometimes collaborated on compositions in the period up to 1945. The nature of this collaboration is also rather a puzzle, since the son was imprisoned in a Nazi forced-labour camp after 1943, while his father continued to conduct at La Scala until he was allegedly assassinated by anti-Fascists. That said, the truth may have been more prosaic – since he died in August it would seem rather belated for revenge or reprisals – and this story is not repeated in the booklet notes here. It does however raise doubts about the nature of the relationship between father and son, although they seem to have remained on friendly terms. Certainly the three works we are given here are entirely the production of the son. 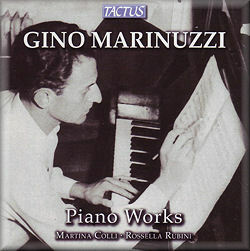 In his later years Gino Marinuzzi the Younger became one of the members of the Italian avant garde, but the three pieces for piano duet that we are given here were written before that period and are in a very traditional style indeed. Indeed the Partita is a piece of neo-classicism which adheres extremely closely to ‘back-to-Bach’ models, even though the medium of two pianos produces a very beefy sound by baroque standards which betrays the fact that this music is definitely a product of the twentieth century. The Sarabande [track 3] has a hieratic beauty that more closely resembles Ravel than any eighteenth century model. The Divertimento is a set of variations on the French folksong Frère Jacques, also familiar to us through Mahler’s use of the theme as Bruder Martin in the third movement of his First Symphony. It must be said immediately that Martinuzzi’s employment of the tune is not as entertaining as Mahler’s decidedly tongue-in-cheek setting – possibly orchestral garb would have helped bring out the humour that is undoubtedly present in the boisterous finale,. Here the two pianists treat it in a suitably off-hand fashion which is reminiscent of Grainger at his most rambunctious. The thirteen movements of Lagerlieder - divided here into five tracks, some of the movements being continuous - are amazingly light-hearted pieces considering their circumstances of their composition in the German prison camp of Ludwigshaven. However there are certainly moments of protest where the two pianos strike sparks off each other with violently percussive attacks as in the War song [track 13]. The Canzone slava [track 14] is well-known to English listeners under the title The carnival is over, and is subjected to a very Graingeresque treatment in a set of variations which almost threaten to break into Men of Harlech – the booklet refers to a “barely audible but effective series of quotations,” the identification of which could provide hours of innocent enjoyment. It ends with a series of slamming bitonal chords which hardly interrupt the dancing pulse of the music – rather like a drunken parody of Bartók. The final five songs [track 15], linked movements, are more obviously Slavonic in feel but again there are sly references to other material – God rest ye merry, gentlemen peeks through at one moment in the Gypsy dance [1.37] only to be succeeded by a hints of the Volga boat song [from 2.12], Kalinka [from 3.46], The holly and the ivy [from 5.14] and then The carnival is over again [from 6.15] which forms the basis for an emotionally charged finale. All good clean fun, and extraordinary good-humoured considering the circumstances of its composition. Oddly enough, considering the widely different circumstances of the two composers and Marinuzzi’s later career as an avant-gardiste, those who enjoy the music of Percy Grainger will definitely warm to that of the younger Marinuzzi as illustrated on this disc. The two pianists are clearly enjoying themselves as well, and the recorded sound is excellent.